Our dog DNA test will identify the breeds in your mixed-breed dog with a home DNA mouth swab test. The results will enable you to understand the genetic heritage of your dog, their unique traits and predisposition to disease – this test is key to pet wellness which will allow you to maximize your canine’s health. The test starts from just $79 for testing 1 dog with results in 2-3 weeks from the moment we get your samples. 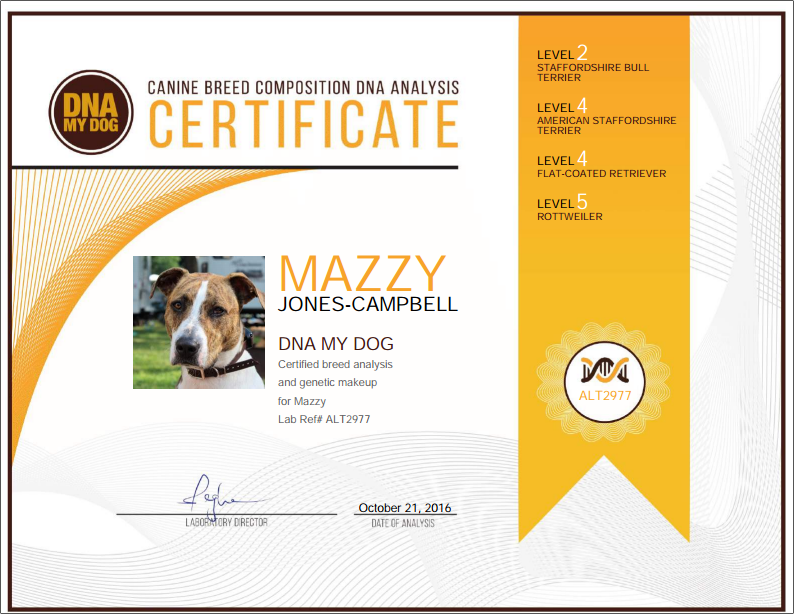 • You will have a certificate with your dog’s photo showing the breed mix, key traits, and an official gold stamp of quality. Do you want to purchase more than 1 Dog Breed test? We are currently giving a $14 discount to clients interested in ordering a second or third breed test. Our clients can also benefit from a $10 discount if they order a Dog Allergy Test (priced at $99) with their DNA My Dog Breed test. We are also providing dog owners with the opportunity to purchase a premium package priced at $195 which includes the Canine Genetic Age test, Breed test and Allergy test. What are you waiting for? Take advantage of our discounted prices today to learn more about your loyal friend!